Tatalina Air Force Station (1952-Present) - A Cold War U.S. Air Force Station, part of the Alaska AC&W Radar Network and located near McGrath, Alaska. Initially functioned as a Ground Control Intercept (GCI) radar site, with a Permanent System ID of F-10. Later redesignated a surveillance site. Became a contractor maintained minimally attended radar site in 1984 and was redesignated as Tatalina Long-Range Radar Site with a JSS ID of A-05. Now feeds radar track data to the FAA Anchorage ARTCC (ZAN) and to the Elmendorf NORAD Regional Air Operations Center (RAOC). Active Long-Range Radar Site (LRRS) with an FAA ID of ZTLJ. Tatalina AFS Upper Site Aerial View. Tatalina AFS Upper Radar Site (background) WACS Site (foreground). Tatalina Air Force Station Upper Site. The site was surveyed by ACC and USACE in 1949 and 1950. Construction began early in 1951 and the site was in operation in 1952 but not fully completed until 1954. The site was constructed by Haddock Engineers, Ltd with a total construction cost of $4,136,353. The site became operational in April 1952 as Tatalina Air Force Station manned by the 717th AC&W Squadron which had been activated to operate and maintain the site. Initial radar equipment included the CPS-5 search radar and later an FPS-3 search radar and one FPS-6 height-finder radar. In the 1960s the radars were upgraded to one FPS-20 search radar and one FPS-90 height-finder radar. The FPS-20 was later upgraded to a FPS-93A search radar. Radar track data was manually passed to the Murphy Dome Manual Direction Center on voice circuits. The FYQ-9 Semiautomatic Data Processing and Display System became operational in 1965, eliminating the need to pass aircraft track data manually. In 1977 contracted support personnel began replacing military personnel in certain positions. In 1983 Tatalina began transmitting its radar data via satellite to the Elmendorf JSS Regional Operations Control Center (ROCC) which was activated on 14 Jun 1983. The FPS-117 Minimally Attended Radar (MAR) was installed in Apr-May 1985 and became operational on 24 May 1985, with operations and maintenance placed in the hands of civilian contractors. The FPS-117 radar fed data to the new Elmendorf ROCC FYQ-93 computers via satellite. By 2011 the MAR FPS-117 radars were outdated and increasingly unsupportable because parts and components were no longer available. In 2011 the U.S. Air Force awarded Lockheed Martin $46.8 million in contract options to begin modernization of 29 long-range radars. Under the EPRP contract, Lockheed Martin was to modernize 15 radars in Alaska including Tatalina. The last FPS-117 site was upgraded in June 2015. The Tatalina Long Range Radar site also feeds radar track data from the search radar and IFF systems to the FAA's Anchorage Air Route Traffic Control Center (ARTCC) for management of civilian and military aircraft in the Alaska airspace. The FAA Identifier for the Tatalina LRRS is ZTLJ (or just TLJ in some lists) and the Anchorage ARTCC FAA Identifier is ZAN. Double domed composite buildings at Sparrevohn same as at Tatalina LRRS. Tatalina AFS Upper Site Access Road. The physical plant of the site was originally divided into an upper main site at 3,200 feet, a lower cantonment area, and a radio site. The upper main site housed the radar towers and the backup generators and quartered about 15 personnel. The cantonment area housed the operations area, the enlisted quarters (BAQ), the bachelor officer's quarters (BOQ), the orderly room, the dining hall and other support areas in a single large composite building. A separate recreation hall was connected to the composite building. No family housing was provided as this was considered a remote unaccompanied tour (1 year). 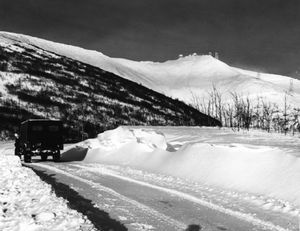 Initially, the upper and lower sites were connected by a 4,300-foot tramway and a difficult switchback road. The tramway was deactivated in 1959 because of accidents and reliability problems. The road was rerouted to make for easier access. The site was accessed and supplied from the outside world using an airstrip 1.5 miles southwest of the lower camp and in the summer by barges via a barge landing 16 miles away at Sterling Landing on the Kuskokwim River. 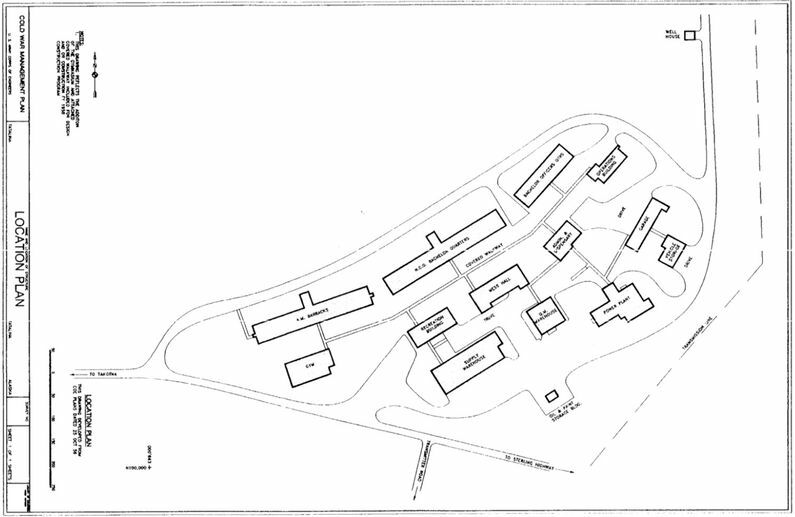 Tatalina Air Force Station Original Plan (before the domes) circa 1954. A separate radio site housed the radio equipment for directing aircraft intercepts while the site functioned as a GCI site. The Tatalina WACS was built in 1956 and 1957 and activated on 27 Oct 1957. This site was considered co-located with the Tatalona AC&W radar site and the two shared support facilities. The site itself was located on an adjacent ridge to the Tatalina AFS upper site. A microwave tower was located closer to the Tatalin AFS upper site. The WACS equipment building was a 4,160 square-foot facility with three POL storage tanks having a total capacity of 1325 barrels. 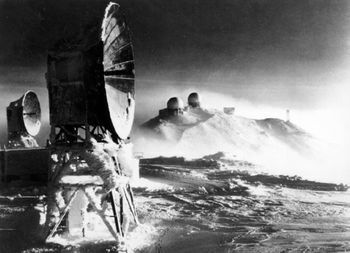 The Tatalina WACS had a two-30' dish tropo link between the Sparrevohn WACS (127 miles), a two-30' dish tropo link to Kalakaket Creek WACS (107 miles) and a microwave link to McGrath. Microwave to McGrath (???) ????. 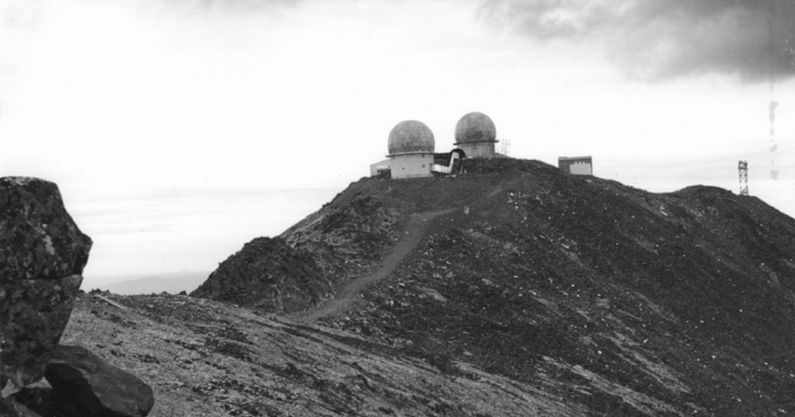 The Tatalina WACS was inactivated in February 1979 and replaced by an Alascom-owned satellite earth terminal. 8 Dec 1952 - Activated, 531st Aircraft Control and Warning Group. 13 Apr 1953 - 10th Air Division. 1 Nov 1957 - 5060th Aircraft Control and Warning Group. 1 Jul 1959 - 11th Air Division. 1 Aug 1960 - 5070th Air Defense Wing. 1 Nov 1961 - Alaskan Air Command. 15 Jul 1977 - 531st Aircraft Control and Warning Group (later various TAC commands). Active long-range radar site. Most of the original AC&W structures (about 34) were demolished in the mid-1980s. The site also had an environmental remediation project that has further erased signs of the old AC&W site and the White Alice tropo site. There are six remaining AC&W facilities including a gymnasium (Fac 3033), a water supply building (Fac 3065), a surface weather observation facility (Fac 3073), a radome tower for the FPS-117 (Fac 3095), the airfield (Fac 75339), and much of the road system (Fac 85017). The four MAR System buildings at Tatalina include an industrial building/maintenance shop (Fac 3001), a residential building/civilian camp (Fac 3003), an incinerator (Fac 3004), and a fuel pump station (Fac 3072). The industrial building/maintenance shop (Fac 3001) and the residential building/civilian camp (Fac 3003) were two joined aluminum geodesic domes - one dome for radar operations and the second for housing. 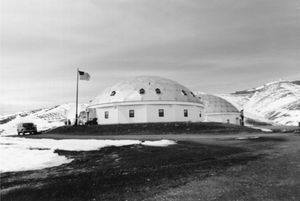 The MAR domes were innovative designs used only in Alaska. Their use was controversial, with the construction team opposing their employment, but the customer or design organization (Corps) was strongly committed to them. 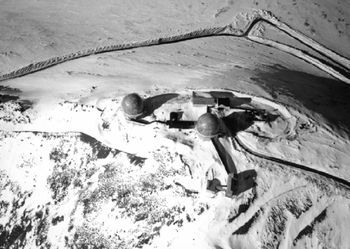 MAR domes made a dramatic impact on base facilities, producing economies of scale. The domes remain in place (2018). Denfeld, D. Colt Ph.D., The Cold War In Alaska: A Management Plan For Cultural Resources, 1994-1999, U.S. Army Corps of Engineers, August 1994, 327 pages, Pdf, page 65-66, 166, 245. Top Cover and Global Engagement - A History of the Eleventh Air Force, page 42. Reynolds, Georgeanne Lewis, Historical Overview And Inventory: White Alice Communications System, U.S. Army Corps of Engineers Alaska District, April 1988, prepared for USAF, Alaskan Air Command, Elmendorf Air Force Base, Anchorage, Alaska, 16 pages, White Alice USACE, 15. This page was last modified 15:46, 9 January 2019 by John Stanton.